William "Extra Billy" Smith (September 6, 1797–May 18, 1887) was a lawyer, congressman, the thirtieth and thirty-fifth governor of Virginia, and the oldest Confederate general to hold field command in the American Civil War. Smith was born in Marengo, King George County, Virginia. He attended private schools in Virginia and Plainfield Academy in Connecticut. He then studied law and was admitted to the bar and commenced practice in 1818 in Culpeper, Culpeper County, Virginia. He established a line of United States mail and passenger post coaches through Virginia, the Carolinas, and Georgia in 1831. It was in this role that he received his nickname. Given a contract by the administration of President Andrew Jackson to deliver mail between Washington, DC, and Milledgeville, Georgia (then the state capital), Smith extended it with numerous spur routes, all generating extra fees. During an investigation of the post office department, Smith’s extra fees were publicized, and he became known as “Extra Billy” in both the North and South. Smith served as a member of the Senate of Virginia from 1836 to 1841, when he resigned. He successfully contested, as a Democrat, the election of Linn Banks to the Twenty-seventh Congress and served from March 4, 1841, to March 3, 1843. He failed to be reelected in 1842 to the Twenty-eighth Congress. He then moved to Fauquier County. Smith served during the Mexican-American War as governor of Virginia from 1846 to 1849 and was an unsuccessful candidate for election to the US Senate during that period. He moved to California in April 1849 and was president of the first Democratic state convention in 1850. He returned to Virginia in December 1852 and was elected to the Thirty-third Congress and to the three succeeding Congresses (March 4, 1853–March 3, 1861). When Virginia seceded from the Union, Smith declined to accept a commission as a brigadier general because he rightly admitted he was “wholly ignorant of drill and tactics.” A few weeks after the war started, he was present during a Union cavalry charge at the battle of Fairfax Court House (June 1861). He took command of the Confederate troops after the death of their commander and found he enjoyed the experience. He requested a commission and was appointed colonel of the Forty-ninth Virginia Infantry regiment just three days before the first battle of Bull Run, where the regiment and new commander performed well. Smith served in the Confederate Congress in 1862 but returned to the Forty-ninth Virginia regiment at the start of the Peninsula campaign. He was wounded at the battle of Seven Pines, and his regiment received favorable notice in his commander’s report. During the Seven Days’ Battles, the regiment was lightly engaged, but Smith and his command again were described as having “characteristic coolness” and “fearlessness.” He was known for expressing contempt for West Point graduates (“West P’inters”) and their formal tactics, recommending common sense to his men instead of a military education; and he distinguished himself with his unorthodox field uniform, including a tall beaver hat and a blue cotton umbrella. At the Battle of Antietam, Smith temporarily commanded a brigade in Maj. Gen. Jubal Earl’s division. He was wounded three times but continued to command, and Maj. Gen. J. E. B. Stuart wrote that he was “conspicuously brave and selfpossessed.” By the end of the battle he had to be carried from the field. In recognition of his performance, he was promoted to brigadier general as of January 31, 1863. He commanded a brigade in the battle of Chancellorsville but achieved no distinction in this role. By the time of the Gettysburg campaign, Smith’s superiors were leery of his performance but had to provide subtle influence because he was the former governor and at the time the governor-elect of Virginia. Early directed Brig. 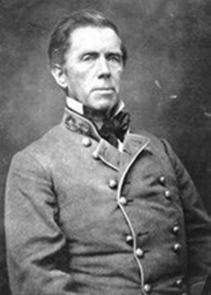 Gen. John B. Gordon to keep close contact with Smith and effectively exercise a joint command over their two brigades. During the Battle of Gettysburg, Smith refused to pursue retreating Union XI Corps troops, concerned that a Union force was approaching from his left, which was a significant reason that the Confederates failed to attack and take Cemetery Hill on July 1, 1863. Smith was the oldest general on the field and fought (unsuccessfully) the oldest Union general, Brig. Gen. George S. Greene, at Culp’s Hill on July 3, 1863. He was the only general not commended in Earl’s official report and, as a result, decided to resign his commission on July 10. He nevertheless received an essentially honorary promotion to major general and assistant inspector general on August 12 and performed recruiting duty in Virginia. Before the Gettysburg campaign, Smith was elected again as governor of Virginia and served from January 1, 1864, to the end of the war. He was among the first Southern governors to advocate arming blacks to provide manpower for the Confederacy, and he occasionally returned to the field to command troops in the defense of Richmond. He was removed from office and arrested on May 9, 1865 but was paroled on June 8. He returned to his estate, “Monte Rosa” (later renamed “Neptune Lodge”), near Warrenton, Virginia, where he engaged in agricultural pursuits. At the age of eighty, he became a member of the Virginia House of Delegates (1877–1879). He died in Warrenton. Source of information: Wikipedia, the free encyclopedia. en.wikipedia.org.